A thoughtful look at the greatest challenge facing each of us: death, whether our own or a loved ones. Weaving together material from many sources, this collection provides a context for understanding death and experiencing it with awareness and equanimity. Here are passages from the Pali texts, writings of S.N. Goenka, poems, theoretical expositions, and questions and answers. But perhaps the most compelling parts are the sections by or about meditators confronting the end of life. With humility, tenderness and often a smile, they learn to accept their own impermanence, suffering and non-self. Their courage and compassion gives every Vipassana meditator an example to which we can aspire. Have you ever heard the saying, "None of us are going to get out of this one alive"? Isn't that the truth! The Art of Dying has wonderful stories by Vipassana meditators who faced illness and their imminent death with grace and ease. Read Rodney's story - he shows us wisdom and what 'accepting' is all about as he shares his experience of his body dying but not his life. We get a glimpse of true metta for the self and others as he shares with us his feelings and experiences. This book is a gift to all of us. A useful, warm collection of S.N. 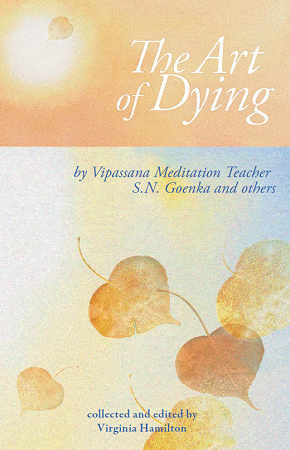 Goenka's teachings on Vipassana and death, personal stories of Vipassana practitioners and family dealing with death and approaching death, and relevant Buddhist Sutta excerpts. A core teaching of Vipassana is anicca or the impermanence of all materials things, the body, thoughts, feelings, and the sense of "l". While we experience anicca all through life, death is the ultimate experience of anicca. These teachings and stories give inspiration to help one with Vipassana wisely face this ultimate experience of anicca with dignity, peace, fulfillment, and acceptance. Very enlightening book. I never understood death until I read this book. It is a must read. The art of dying gave me so much inspiration. The book contains personal stories and interviews of meditators near death. This helps to understand how Vipassna practice can help handling this situation. The book contains essential parts of Dhamma theory. I just couldn't lay my hand off it. This is a collection of stories which can help anybody in difficult time, like chronic illness. I love the book. The first chapter, when Goenka told the story about his mother dealing with her upcoming death, was very valuable. I love all the stories. They give me the lesson I could learn from. This is a beautiful, wise and consoling book. Please read it. This is an incredible book which recounted the moment and events leading to death of some Vipassana meditators. It is a compilation of actual cases and will be a big help to those who have come to know that death is at their doorstep, such as cancer patients. Most importantly by knowing how other meditators had dealt with the situation it will help us deal with ours in own final moment. It will help alleviate fear of this epochal event as well as enable us to know beforehand of what we should do then. The book also stresses the utmost importance of continuous daily practice if we want to prepare. A thoughtful and spiritual way to cross over. I found this way of dying to be quiet and meditative something we all would love to have happen. I believe meditation is for all of us, but how many actually take the time? I will, to the best of my ability, try to leave this illusive world quietly and this book shows how some have accomplished this.